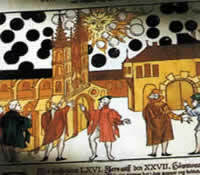 A student in Basel, Switzerland reported that just after dawn on August 7, 1566, "many large, black globes were seen in the air, moving before the sun at great speed and turning against each other as if fighting. Some of them became red and fiery and afterwards faded and went out." 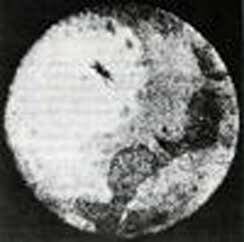 Related: First UFO photograph and a most unusual sighting was reported by Monsieur de Rostan, an amateur astronomer and member of the Medicophysical Society of Basel, Switzerland. On August 9, 1762, at Lausanne, Switzerland, he observed through a telescope a spindle-shaped object crossing and eclipsing the sun. Monsieur de Rostan was able to observe this object almost daily for close to a month. He also managed to trace its outline with a camera obscure and sent the picture to the Royal Academy of Sciences in Paris. 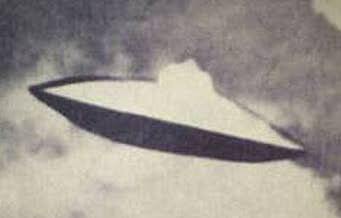 Unfortunately, his image -- probably the first one ever obtained of a UFO -- no longer exists. 1663 - August 15th, Saturday. As the people of the village Robozero (in the Bolozero district, Russia) were in church they heard a loud noise in the sky and many people left the church to see what was up. One of them was the farmer Levka Pedorov who told the stort to the monastery monk, who documentetd it in script. In midday a "great ball of fire" descended from the south in a clear blue sky over Robozero and moved across the church to the near lake. The "ball" was 45 meters in diameter and two beams of "fire" were shooting out from the front and then, after it went from the south to the west (500meters from Pedorov), it "dissapeared". Only to re-apear an hour later over the same lake. And there it stayed for an hour and a half. A company of fishermen in a boat on the lake a mile away from Pedorov were sorely burnt by the light of the "ball", which lit up the lake to it's bottom 9 meters deep, while the fish fled to the banks. Pedorov described the water as if "covered with rust under the glow..."
Astronomer Jose Bonilla, at Zacatecas, Mexico Observatory, witnessed anywhere from 100-400 disc-shaped or cigar shaped objects crossing the face of the sun. He even managed to take a photograph through his telescope of one of the craft. The August 18, 1911 "Reno (NV) Gazette" carried a brief item tided "Meteor From The Sea Does Strange Stunts." It is said that upon the arrival of the ocean liner "America Maru" in San Francisco from the Orient on August l7th a report was made of a meteor which "climbed out of the sea like a skyrocket, traveled through a great arc and disappeared." The captain, A.C. Stevens, said it had a great fiery head and a long trail and was seen on August 11th. The item would normally be of minor interest except that meteors do not climb out of the sea. An effort was made to locate more from the San Francisco area from where the report had originated. Confirmation came quickly. On the same day as the Reno item, the "San Francisco Examiner" carried a story, "Meteors And Moon Rainbows Awe Ship -A Night in Hawaiian Seas Made Brilliant for Passengers on America Maru." This report was a bit more expansive, stating that while passengers were on deck the previous Friday evening, a large meteor shot up out of the ocean, made a complete circle of the sky, and sank again into the water. At the time, the ship was two days out of Hawaii. It was seen to be about the size of a ten-inch cannon ball and displayed a trail many miles in length. The first third of the trail was as round as a rod and glowing red. The remainder "gradually expanded in graceful proportions." A half an hour later, the night watchman called for witnesses to view a large lunar rainbow. Shortly after this observation, another meteor rose out of the sea to a height of 20 degrees and sank again. This object was smaller than the first but the trail seemed to break away and precede the head into the sea. What can be made of this story? I had thought of the possibility of volcanic eruptions, with the ship being two days from the volcanic Hawaiian Islands. The eruptions would hurl flaming rock high into the air, trailing hot debris and giving the appearance of a meteor shooting from the water. However there seemed to be no reports of noise or vibration from such an eruption, or no glow from the horizon from a distant volcano. We also have the "meteor" making a circuit of the sky, hardly a falling rock. One small detail before closing this account. The Gazette concluded by adding that a copy of the ship's log with a description of the phenomenon "was forwarded to Washington." In all likelihood this was sent to the U.S. Hydrographic Office, which was known to have collected such reports for study. Another report in the "Reno Gazette" (July 25th) told of the people of Durango, Colorado seeing a large ball about the size of the full moon moving through the sky. It sounds like an especially bright meteor, which can sometimes rival the full moon in brightness. But the report continued, "For several hours the phenomenon lasted. At first it seemed to be traveling toward the earth and gradually grew larger until it developed to a size half again as large as a full moon. Finally, it began to grow smaller and in time disappeared entirely." The only known phenomenon of such long duration might be a display of aurora. It is a fluid phenomenon though and a single, compact display lasting several hours would be a far-fetched explanation for this report. August, 1949 -- Clyde W. Tombaugh, astronomer, saw a circular pattern of rectangular lights, keeping fixed interval. August 1950 - Don't Tell A Trained Engineer He Hasn't Really Seen A UFO! In August 1950 at RAF Farnborough, Stan Hubbard, an experienced test pilot, was walking across the airfield when he heard a humming, hissing sound. "I turned round and saw a strange object approaching. It looked like an edge-on view of a sports discus. It was pearly grey and appeared to be crackling and sparking and gave the impression there was something moving on it." A month later, Hubbard and five other officers had a similar weird sighting from the watch-tower at Farnborough. The Air Ministry was not convinced and concluded that in the first sighting, Hubbard "was either a victim of an optical illusion or observed some normal aircraft and deceived himself as to its shape and speed." As to the second sighting, the Ministry said, "We conclude that the officers saw some quite normal aircraft at extreme range and were led by the previous report to believe it to be something abnormal, an interesting example of one report inducing another." "Absolute rubbish," said Hubbard last week. "My engineering experience convinced me it was not of this earth. We do not have the technology capable of that sort of performance." This was a time when the threat of atomic war with the Soviet Union hung over the world. Whitehall did indeed fear an alien invasion but not from space, from Eastern Europe. In an action it has always denied until records were found recently, the Ministry of Defence in August 1950 set up the Flying Saucer Working Party (many UFOs seemed to look like flying saucers) to sift through the many claimed sightings. An August 1950 FBI memorandum talked about the alarming increase in UFO sightings above not only the nations nuclear weapons facilities, but over other top secret areas as well. Hastings (Robert Hastings, "UFOs: The Hidden History") said it was obvious to him that these flying objects began to express an increased interest in the nation's nuclear weapons program. And, justifiably so, he said, the government became deeply concerned and began debunking the UFO theories. "At least initially, the secrecy, the censorship, the denial of the existence of all this was the appropriate course of action. Until our leaders could determine that this did not represent a genuine threat to the national security, I think the secrecy and the falsehoods that were publicly presented about UFOs were entirely appropriate and justifiable. But decades ago, the secrecy should have slowly but surely ended. People should have been made aware of the reality of all this. This is not science fiction, this is not Hollywood, this is not the funny papers." Hastings asked how many of those in attendance had ever heard of UFOs reported at nuclear weapons sites. A show of hands indicated that about 20 of the 300 people there had. 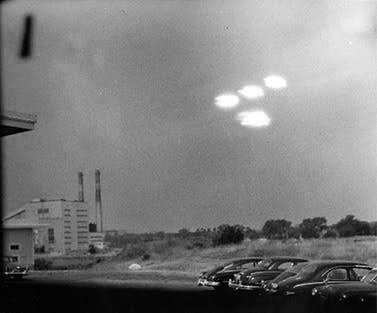 August 1951 - Official UFO Photo From US Gov't? Detail and data on this are murky at best, but the image (above) is said to have been taken in flight, around 1951 by the US Marine Air Group over the North China Sea during the Korean war. 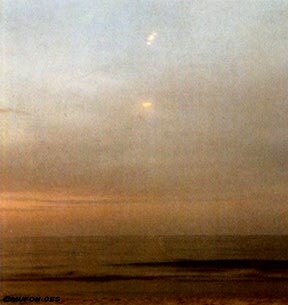 This is image is one of the more controversial UFO photos around. Like many UFO incidents/photos from the past, info varies widely from many sources as to date, location, etc. The case began not in Lubbock, but that same evening, August 25, 1951, in Albuquerque, New Mexico, 250 miles away to the Northwest. A scientist who worked for the Atomic Energy Commission at the Sandia Corp. Lab was sitting with his wife in his back yard enjoying the early evening. 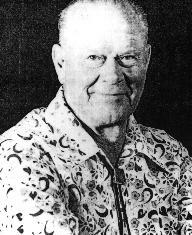 On August 5, 1952, James Bartlett, astronomer, saw during the daylight observation of Venus a flight of two disks with a diameter about 30 minutes of arc; passed overhead and turned east. Then two more disks with dome-like protrusions in the center. Personal Minute from the Prime Minister, Mr Winston Churchill to the Secretary of State for Air, Lord Cheswell, dated 28 July 1952. "What does all this stuff about flying saucers amount to? What can it mean? What is the truth? Let me have a report at your convenience." Minute from Secretary of State, dated 9 August 1952, dismissing stories about flying saucers. August 26, 1953 --Air Force Regulation 200-2 issued by Secretary of AF Harold E. Talbott: procedures for reporting UFOs, restrictions on public discussion by Air Force personnel. One of the most controversial radar visual reports of the fifties occurred on August 31st, 1954. The story leaked out in December, 1954, and made front page headlines. The official navy file on the event remained classified until the Directorate of Naval Intelligence released a copy upon my request in 1982. During his 1973 visit to Australia, Dr. Hynek was able to interview the pilot involved in this famous incident, which became known as the "Sea Fury" encounter. 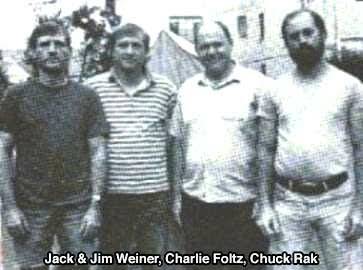 Dr. Hynek made his notes on this interview available to me during my 1984 visit to the Chicago headquarters of his organisation, the Centre for UFO Studies (CUFOS). I, in turn, provided Dr. Hynek with a copy of the official file on the incident. Lieutenant J.A. O'Farrell was returning to Royal Australian Navy Air Station Nowra after a night cross country in a Sea Fury aircraft. After contacting Nowra at about 1910 hours, O'Farrell saw a very bright light closing fast at one o'clock. It crossed in front of his aircraft taking up position on his port beam, where it appeared to orbit. A second and similar light was observed at nine o'clock. It passed about a mile in from of the Sea Fury and then turned in the position where the first light was observed. According to O'Farrell, the apparent crossing speeds of the lights were the fastest he had ever encountered. He had been flying at 220 knots. O'Farrell contacted Nowra who in turn confirmed that they had two radar "paints" in company with him. The radar operator, Petty Officer Keith Jessop, confirmed the presence of 2 objects near the Sea Fury on the G.C.I. remote display. The two lights reformed at nine o'clock and then disappeared on a north easterly heading. O'Farrell could only make out "a vague shape with the white light situated centrally on top." These 1956 events have become iconic in status among UFO historians as 'the Lakenheath case' or 'the Lakenheath/Bentwaters case', one of the few incidents classified as 'unexplained' by the 1969 Colorado University UFO study commissioned by the US Air Force, which conceded that "the probability that at least one genuine UFO was involved appears to be fairly high." But the true extent and complex nature of the events in East Anglia have never been fully revealed, and divining the truth from a mass of contradictory evidence has confounded even the most dedicated of UFO researchers. On 13th August, 1960, near midnight, while traveling east of Corning, California, state police officers Charles Carson and Stanley Scott witnessed a lighted object drop from the sky. In fear that the object might fall upon their vehicle, they exited the vehicle and ran for cover. The object continued to falling, to an altitude of approximately 100 feet. At that point, it reversed direction suddenly and climbed to an altitude of approximately 400 feet. It stopped at that point and began to hover. 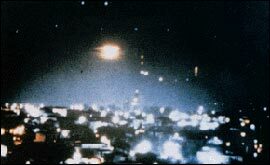 Aug. 23, 1960, Wichita, Kansas marks the finally of a three month flap of UFO sightings by thousands of witnesses across three states, culminating in a radar confirmation which prompted Air Force official to scramble to cover-up the wave of sightings as being nothing more than mistaken stars twinkling. Reporters as well as Boeing engineers and various aviation experts were eye-witnesses to sightings in this period, but all were simply told they were mistaken by US officials. Highway engineer Rex Heflin took a series of 4 Polaroid photos of a silvery craft near Santa Ana, California. Over a period of about 2 minutes the craft moved east, 'wobbling' slightly, gained altitude slowly, then increased its velocity and altitude more rapidly, leaving behind a ring of smokelike vapour. Several scientists and other researchers launched an all-out effort to study the photos. In September 1965 two men in civilian clothes, claiming to be from the North American Air Defense, came to Heflin's home and 'borrowed' 3 of the original photos. The photos were never returned and the 2 visitors were never traced. However, copies of the stolen photos continued to be analyzed. They were regarded as most probably genuine though some doubts remained. Bowing to public pressure and the recommendation of its own O'Brien Committee, the Air Force announced in August 1966 that it was seeking a contract with a leading university to undertake a program of intensive investigations of UFO sightings. The new program was designed to blunt continuing charges that the US Government had concealed what it knew about UFOs. On 7 October, the University of Colorado accepted a $325,000 contract with the Air Force for an 18-month study of flying saucers. Dr. Edward U. Condon, a physicist at Colorado and a former Director of the National Bureau of Standards, agreed to head the program. Pronouncing himself an "agnostic" on the subject of UFOs, Condon observed that he had an open mind on the question and thought that possible extraterritorial origins were "improbable but not impossible." Brig. Gen. Edward Giller, USAF, and Dr. Thomas Ratchford from the Air Force Research and Development Office became the Air Force coordinators for the project. In February 1967, Giller contacted Arthur C. Lundahl, Director of CIA's National Photographic Interpretation Center (NPIC), and proposed an informal liaison through which NPIC could provide the Condon Committee with technical advice and services in examining photographs of alleged UFOs. Lundahl and DDI R. Jack Smith approved the arrangement as a way of "preserving a window" on the new effort. They wanted the CIA and NPIC to maintain a low profile, however, and to take no part in writing any conclusions for the committee. No work done for the committee by NPIC was to be formally acknowledged. Ratchford next requested that Condon and his committee be allowed to visit NPIC to discuss the technical aspects of the problem and to view the special equipment NPIC had for photoanalysis. On 20 February 1967, Condon and four members of his committee visited NPIC. Lundahl emphasized to the group that any NPIC work to assist the committee must not be identified as CIA work. Moreover, work performed by NPIC would be strictly of a technical nature. After receiving these guidelines, the group heard a series of briefings on the services and equipment not available elsewhere that CIA had used in its analysis of some UFO photography furnished by Ratchford. Condon and his committee were impressed. 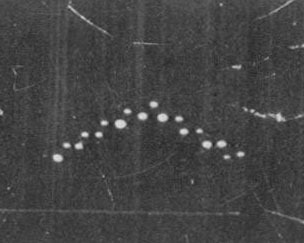 Condon and the same group met again in May 1967 at NPIC to hear an analysis of UFO photographs taken at Zanesville, Ohio. The analysis debunked that sighting. The committee was again impressed with the technical work performed, and Condon remarked that for the first time a scientific analysis of a UFO would stand up to investigation. The group also discussed the committee's plans to call on US citizens for additional photographs and to issue guidelines for taking useful UFO photographs. In addition, CIA officials agreed that the Condon Committee could release the full Durant report with only minor deletions. In April 1969, Condon and his committee released their report on UFOs. The report concluded that little, if anything, had come from the study of UFOs in the past 21 years and that further extensive study of UFO sightings was unwarranted. It also recommended that the Air Force special unit, Project BLUE BOOK, be discontinued. It did not mention CIA participation in the Condon committee's investigation. A special panel established by the National Academy of Sciences reviewed the Condon report and concurred with its conclusion that "no high priority in UFO investigations is warranted by data of the past two decades." It concluded its review by declaring, "On the basis of present knowledge, the least likely explanation of UFOs is the hypothesis of extraterrestrial visitations by intelligent beings." Following the recommendations of the Condon Committee and the National Academy of Sciences, the Secretary of the Air Force, Robert C. Seamans, Jr., announced on 17 December 1969 the termination of BLUE BOOK. "We had just ordered up some pizzas and since it was such a warm evening, we decided to step out on the terrace," recalled Pang. "There were no windows directly facing us from across the street, so John just stepped outside with nothing on, in order to catch a cool breeze that was coming in right off the East River. I remember I was just inside the bedroom getting dressed when John started shouting for me to come out on the terrace. I yelled back that I would be right there but he kept screaming for me to join him in that instant. As I walked out onto the terrace, my eye caught this large, circular object coming towards us. It was shaped like a flattened cone and on top was a large, brilliant red light, not pulsating as on any of the aircraft we'd see heading for a landing at Newark Airport. When it came a little closer, we could make out a row or circle of white lights that ran around the entire rim of the craft - these were also flashing on and off. There were so many of these lights that it was dazzling to the mind. It was, I estimate, about the size of a Lear jet and it was so close that if we had something to throw at it, we probably would have hit it quite easily." Eerily the object passed by. "We often had helicopters flying above us but this was as silent as the night and about seventeen storeys above street level." The object flew off but returned later, by which time she and Lennon had set up a telescope through which they could view it in more detail. "The light was so brilliant coming from the craft that no additional details could be seen. We did take a couple of pictures but they turned out overexposed." They also rang a local newspaper to report the sighting and were told at least seven other people had seen the UFO too. A nightmare event which trapped four men in one of the most curious abduction cases in UFO history. Artist Chuck Rak, and three friends from the Massachusetts College of Art - Charlie Foltz, and twins Jim and Jack Weiner went canoeing in the Allagash Wilderness Waterway in Maine, situated between the White Mountains and New Hampshire -- oddly enough, the very area where Betty and Barney Hill were abducted by aliens in September of 1961 (and also close to Loring AFB which had experienced its own share of bright, unexplained lights over its weapons facilities in early 1975). On the first day of their outing the men climbed Mount Katahdin, a place known to be sacred to the American Indians of the region, and home of the grest spirit Pomola. Interestingly, Henry David Thoreu climbed this same mountain in 1846 and reported having a significant spiritual experience. The following day, the men met up with their aerial connection to get them to Telos Lake accessible only by pontoon plane. After quite a trip into the dense forest region they canoed up Chamberlain Lake, camping at Mud Brook. That night, witnessed by other campers in the area, several UFOs in the form of flashing lights were seen. On the fourth night of their roughing-it, the men decided to do a little night fishing on Eagle Lake. Prior to leaving they wisely constructed a very large bonfire to act as a beacon so they could find their back in the darkness. Not more than 20 minutes out on the water they encountered a "large, bright, pulsing spherical light" ascending over the tops of the trees on the far shore. Charlie flicked his flashlight on and off at the brilliant object with three long and three short flashes. The glowing object replied by suddenly moving directly over them, hovering in complete silence. Frightened, the men paddled wildly to get back to shore. After reaching the campsite they watched the object hover for a while and then simply disappear. But something wasn't right. The bonfire they had built was nothing but nearly cold cinders; a fire which should have burned for several hours was all but dead, and yet, they were certain they had only been gone about thirty minutes. They reported the sighting to a somewhat disbelieving ranger and completed their camping trip without further incident. It was not until 1986 that Jack Weiner started having horrific nightmares that slowly revealed lost information and memory about what had happened during those missing hours on the lake. His dreams contained the classic abduction characteristics and phenomenon -- the men were lifted from their boat into the UFO by some sort of beam of light... they were undressed and examined medically by beings not of this world, described as being spindly, thin and disturbingly insect-like... their memories were expunged... and they were returned to their canoe. Three Security Policemen on duty in Charlie Sector, East Side of Manzano Weapons Storage Area, observed a very bright light that traveled with great speed and stopped suddenly in the sky over Coyote Canyon. They at first thought the object was a helicopter, but after observing the object perform unusual aerial maneuvers, they felt it could not be a helicopter. The light was observed to land in the Coyote Canyon area. Sometime later they observed the light take off again and proceed straight up at a high speed until it was no longer visible. A Sandia Security Guard was driving east on the Coyote Canyon access road on a routine building check of an alarmed structure. As he approached the structure, he observed a bright light near the ground behind the structure. He also observed an object that he at first thought was a helicopter. As he came closer, he observed that it was not a helicopter, but a round disk shaped object. When he attempted to radio for backup, he found that his radio was not functioning. He approached the object on foot armed with a shotgun, and the object thereupon took off in a vertical direction at high speed. Three other unnamed Security Guards observed a light over Coyote Canyon that behaved in a similar manner as the one seen on 8 August. Coyote Canyon is part of a large restricted test range used by the Air Force Weapons Laboratory, Sandia Laboratories, the Defense Nuclear Agency, and the Department of Energy. Kelly Cahill has become a name well associated with UFOs and abduction. The incident appears to involve independent confirma-tion of a CE3 and missing time in that at least two and possibly three groups of people unknown to each other witnessed the same UFO and entities, and experienced missing time. Perhaps for the first time, independent witnesses have offered strikingly similar information, thus making a convincing case for the reality of the strange events described. This reality is further strengthened by a range of apparently related physical traces, including ground traces, a low level magnetic anomaly apparently consistent with the location of the UFO encounter, and effects on some of the witnesses. I referred Kelly Cahill to John Auchettl and his group Phenomena Research Australia (PRA). They had two different laboratories confirm several unusual anomalies and magnetic problems at the apparent site of the UFO landing. Some interesting changes in soil chemistry were detected- an above average sulphur content, the presence of pyrene (which occurs in coal tar and is also obtained by the destructive hydrogenation of hard coal), and tannic acid- in a crescent shaped indentation. There was a triangular formation of dead grass on the ground, spaced out in the site. These physical dimensions represent compelling evidence for a reality underlying abduction events. The case is a striking example of the importance of focusing on the physical evidence for extraordinary UFO events. Such a strategy will provide for insight into the nature and purpose of UFO activity. However, cases like Narre Warren are rare. Most abduction events have little or no direct, unambiguous evidence. Implants, missing fetuses, scars, and other abduction- related anomalies still have not been sufficiently sub-stantiated. Over the years, I have been fortunate to have been able to work with an informal network of scientists who all view the UFO phenomenon as worthy of serious attention. (Many of my "invisible college" colleagues prefer to contribute anonymously because the UFO problem is seen as a forbidden science. First presented on Mexico's popular TV show '3er. 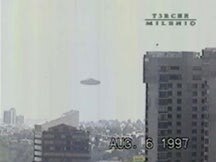 Milenio' (3rd Millenium), this piece of video footage showing a wabbling, spinning flying saucer crossing behind a large apartment building initially had many UFO enthusiasts excited. But analysis would later reveal that the movie was a fairly well constructed fake using computer/video scene merging techniques. Since then the number of computer-driven UFO video fakes has been steady and troublesome. However, to this day, there are those who stand by this footage as authentic. For those interested, you can read a still undetermined analysis by Bruce Maccabe at the time here. If you're really desperate, you can see the video here. A major UFO incident rocked the Southwest Asian nations of Afghanistan and Pakistan on Tuesday night, August 15, 2000. The fleet of UFOs was first seen at 8:15 p.m. in Kandahar, a city in Afghanistan located 200 kilometers (120 miles) southwest of Kabul, the national capital. "Eyewitnesses in Kandahar told Afghan Islamic Press that objects looking like missiles, like 'flames of fire,' moved through the air around 8 p.m. in the evening and fell" across the border in neighboring Pakistan. "'We did not know what they were,' the eyewitnesses said." "People have also observed these things in the border areas of Pakistan, , Shahrkotal, and in Spin Dolbak in Kandahar province." The UFOs were "also seen in Samangan province and Urozgan province" in Afghanistan. "In Afghanistan, the Taliban (ruling Islamic party--J.T.) wondered whether the USA had come out with another cruise missile attack on Osama bin-Laden's hideouts. Frantic calls, mostly by radio and satellite, were made to Khost, Jallalabad and Kabul. By midnight, the Taliban knew and were relieved that this wasn't the case." "Taliban official Mulla Ahmadullah Ahmadi in Kandahar said, 'Some people saw the star-like objects here at 8:15 p.m. They said they made no noise like the cruise missiles and were brightly lit. Also, they said the objects were flying towards Pakistan. Then it became obvious that this was no fresh (new) U.S. cruise missile attack on Afghanistan.'" "The mystery objects, according to reports, have also been sighted in Afghanistan's Zahul province neighboring Kandahar. It is probable that they were seen elsewhere in Afghanistan, as well, but poor means of communication ensures that it will be weeks before such information reaches the media." The UFOs crossed the border into Pakistan at about 8:20 p.m., heading southwest towards the city of Quetta, in Pakistan's Baluchistan province located about 200 kilometers (120 miles) southeast of Kandahar. "Official sources in Quetta said Baluchistan's high- ranking government functionaries spent Tuesday night and the whole of Wednesday," August 16, 2000, "discussing the sighting and searching for the elusive objects." "An aerial reconnaissance was also carried out in Loralal, Barkhan and Kohlu, the places where the flying objects were sighted by many people and also where some of them reportedly fell. A (Pakistani Air Force) helicopter was sent to carry out this task but it returned empty handed." In addition to the civilian eyewitnesses, the UFOs "were also sighted by Colonel Asmatullah," chief of military security for the governor of Baluchistan, "who saw them sailing over Koh-i-Murdar mountain which overlooks Quetta." "Baluchistan Home Secretary Shahryar Khan Mahsud said he is using every means to unlock the mystery of the flying lights." Mahsud said, "We would have dismissed them as gossip if a few people had seen them at just a few places. But we are being told of sightings at several places in northern and central Baluchistan. They were reportedly seen at Chaghi, Quetta, Pishin, Qiila Abdullah, Loralal, Barkhan, Kohlu and Qiila Saifullah." Is the Bonsall UFO back in the Dales? Has the infamous Bonsall UFO been seen above the Dales skies once more? In October last year the Mercury reported how a disc-shaped object had been captured on video over Bonsall Moor for more than six minutes, just hovering quietly in the sky. Some experts have hailed the footage as "the best UFO video ever" and it has been the subject of national and international interest. And on Monday night [Aug 27], Matlock landlady Karen Sismey looked out over the veranda from the Thorn Tree Inn on Jackson Tor Road to spy a similar object in the same area. "My husband Phil had been out there at around 10.45pm when he saw something hovering in the sky, so he shouted me and I came out with my binoculars," said Mrs Sismey. "It was over Bonsall and it must have been just there for a good 15 minutes. "It was showing very vivid colours with red at the bottom, and then ranging from emerald and blue colours to a bright lemon yellow." The object was seen by other visitors to the Thorn Tree, including a BBC cameraman filming in the area - but unfortunately he did not have his camera to hand. "It was too far away to say how big it was but it must have been big for me to be able to see it," Mrs Sismey added. "It was not a helicopter or an aeroplane and I know that it shouldn´t normally be there." 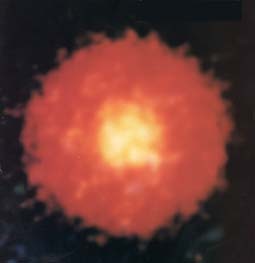 Many believe these images, which similarly appear in many UFO photos of late, are the result of zoom/focus problems on video and digital cameras where the apperture or shutter frame is creating the unique 'dropa stone' shape. There appears to be some convincing evidence that this is indeed happening in many shots, however, improbable examples like the infamous STS "NASA secret transmission" footage cast some doubt on the theory as a blanket debunking. Some Of The Most Unique Products & Services On Earth!